This summer is proving out to be a very educational one while watching Sabre moult feathers. Her blue-grey feathers are slowly starting to replace her dark-grey immature feathers. She has a few additional tail feathers, and three primaries on each wing left to go. We’ll start conditioning in September to prepare for October Hunting. I am so excited to see her adult plumage I can hardly stand it. She’s going to be quite striking as an adult! A strange winter and unplanned travels and events have interfered with our training schedule more than a few times, but we achieved free-flight this week and it was very rewarding as expected. With two solid weeks of regular training on the creance, we were able to build up a flight pattern where we could get three long flights of +100 yards with successive hits to the lure. I was very nervous to free-fly her after our initial creance workouts. Her attention was always distracted and was bating away on close approach. With some additional manning sessions and the consistent training, combined with adjusted attitude, she soon got the hang of the flights out in the field. At +100 yards, she would fly towards me on whistle command, and take a swipe at the lure. Early on in our training, she would get the lure each time she flew at me and struck the lure. In order to encourage returns and second attempts, I began pulling the lure away one time. This encouraged her to circle around and make another pass. Each time she did, I’d provide her with the reward. After hopping up to my glove for a tidbit, she would then alight off my glove, and return to the perch over 100 yards away! She was training up nicely and knew exactly the routine. After the fourth flight, usually she would lose interest, so we’d end it on the third flight with a good reward of a large quail tidbit. 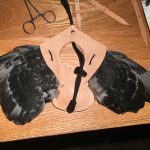 Made this falcon lure from Kangaroo Leather and some pigeon wings I had lying around. 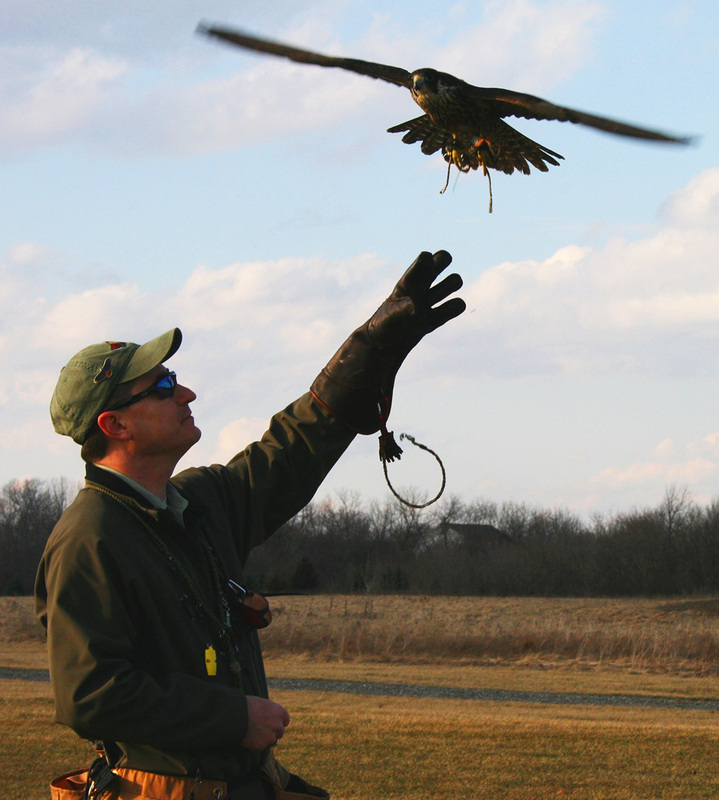 Falconry has been a part of my life for approximately 7 years now. 8 years if you count the first year of ‘preparation’ that occupied every waking moment for the first year before I was licensed. This journey has no destination in mind, and the furthest thing from my falconry aspirations were falcons. 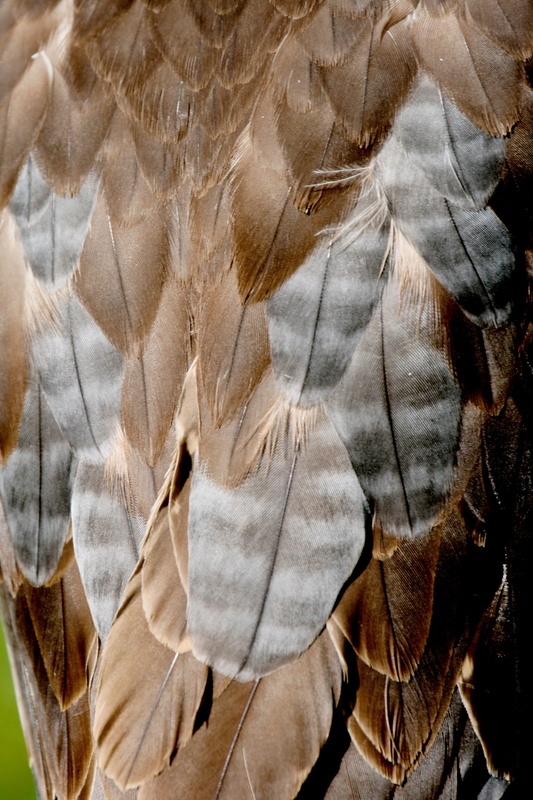 Red-Tailed hawks hold a certain place in the wilderness and after working with them for the past 7 years, I’ve come to rely on their steady hunting style and the ease of hunting them in local areas with an ample supply of wild game to chase. I will continue to enjoy the walks in the woods with a trained Red-Tailed hawk, my trusty companion, Cedar for as long as she is willing to do so. The trapping of a wild Peregrine Falcon was certainly an exciting adventure this fall. In order to get enough trapping time in, we spent a few days camping on a private section of shoreline on Lake Superior with a trapping blind setup. We also took a trip over to Whitefish point for a day. The WhiteFish Point Bird Observatory (WPBO) had been spotting Peregrines daily for the past month, so we figured it was a good place to look for Falcons. Our beach trapping setup was very simple: a mist net and a pigeon lure setup with a ground-blind about 50 yards away. We ended up seeing more falcons down at Lake Erie as the massive hawk migration made its way across Canada into the US across the Detroit River. On a bright afternoon, one of the Peregrine Falcons flying high overhead, hit the pigeon and got caught in the net. 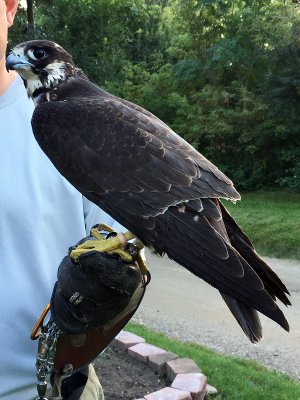 A successful capture of a passage peregrine falcon was the beginning of another realm of falconry. 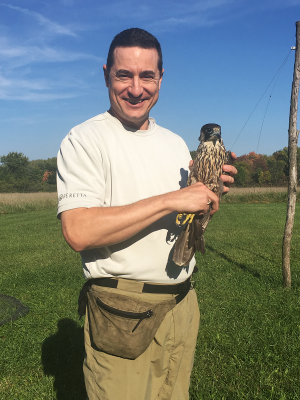 Passage Peregrines are prized for their ability to hunt as well as the calm demeanor and quick pace that they man-down into a mild-mannered game falcon. Once I was able to get through rush-hour traffic on the way home, she was able to perch on the glove and even do so without the bate-fits. Her manning progresses well to date and I’m thrilled to be lucky to have her. Her dark coloration, full dark head ‘moustache marks’ give indication that she is an ‘anatum’ subspecies. 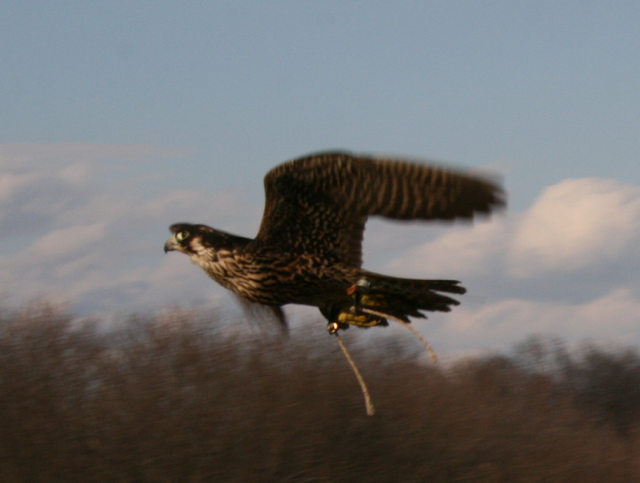 The description of the Continental falcon ‘anatum’ is provided by the Canadian Peregrine Foundation. Positive identification of the subspecies can be a tricky business without doing some level of genetic screening via feathers. I’ve had varius ID suggestions, but she is most likely an anatum. ‘Sabre’ is the given name to her as she is fast, pointy and cuts through the air like a knife. Like a big, sharp, deadly curved sword used in medieval times. I have every confidence that she’ll live up to her name. Sabre is also the first wild-trapped passage Peregrine Falcon in Michigan with an approved permit from the Michigan DNR. I am looking forward to continuing this falconry journey with my newest addition to the Falconry crew. There will be more on this aspect of “Team Austringer” coming up soon. We took a fall weekend to go up to Northern Michigan to enjoy the cool fall weather and some beach scenery. September is a wonderful month to enjoy the outdoors in Michigan, provided that the weather cooperates. Traveling Up North is always a visual buffet of colors, especially in the fall as trees explode in full autumn splendor. By ‘Up North’, I mean to say we camped on the shore of Lake Superior to witness the great spectacle of the beautiful big lake, ‘Gitchee Gumee’. Far Up North, more than the usual trip to the cabin. We spent three days watching hawks, eagles, loons, and geese as they migrated down the coast towards the warmer climes. We took in some of the sights, all the way up to Whitefish Point, where birds congregate on their migratory routes. All this ‘beach bird-watching’ with the purpose of observing falcons during the migration. The adventure was successful, to say that we saw one falcon and enjoyed some beautiful weather for a few days. With the adventures coming to a close, we packed up the dog and the gear in the car and headed home on Sunday morning. With just a few miles under our tires from the campsite, we saw a female Kestrel perched on a snag not far off the road. I stopped the car, loaded up the mice in the B.C. and we pitched the trap out the window with a good serve so she could see it. In just a few minutes, the Kestrel came down from the perch and hit the trap. 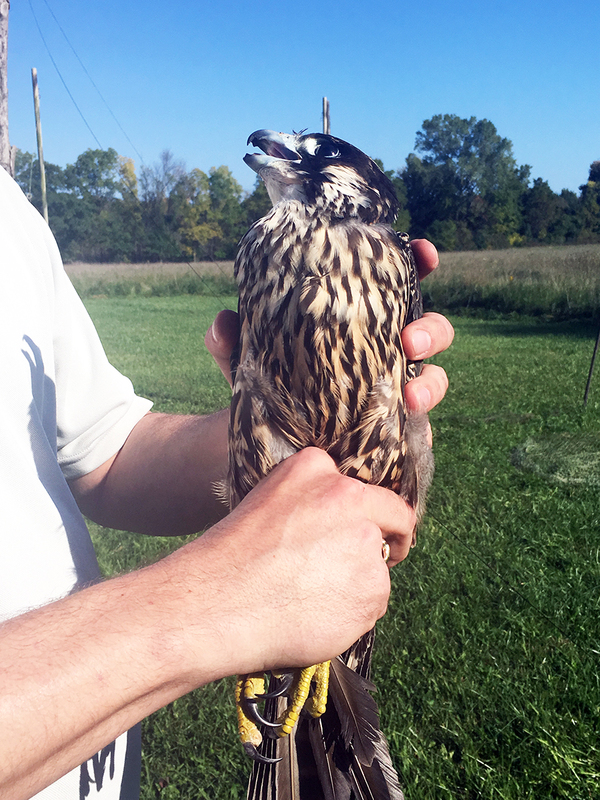 A quick rescue and health survey, we had our first falcon of the weekend. We named her ‘Millie’ which is short for “Millenium Falcon”. 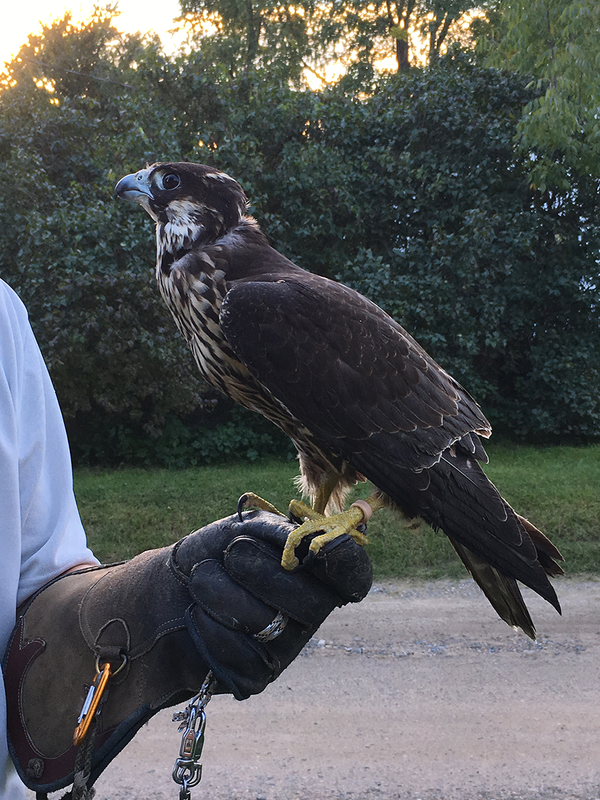 “Millie” is now part of the falconry adventures for Kelly and myself and we are looking forward to all her training into a well-mannered falconry bird. Millie is the second addition to the Falconry menagerie, behind Cedar. 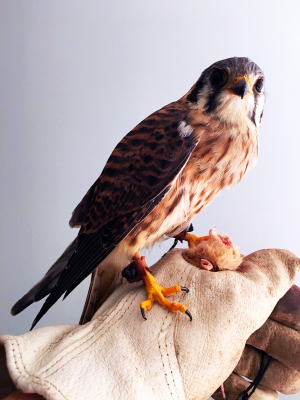 We are hopeful that Millie will train well and become a wonderful falconry bird.